We await enlightenment from the Met Office. In other news, the MET-Office says it can now forecast mountain weather better than before. Wow, just WOW, it was as hot as 1976, now that’s what you call globull Warming and it wasn’t even real. Take a look at Tony Heller on the current US localised “heatwave”, still can’t match 1936. Several June days of 35c+ in 1957,65 & 76, also 32-34+c in 1893, 1915,16,17,33,40,41,47,50,76,96, so we must be doomed by current AGW then! Hottest June day since ’76 – so there was a hotter June day 41 years ago. Why Heathrow, where we know there are hot jet exhaust plumes all over the place. Are the temps in the Met Office graphic maximums or hourly averages? I seem to recall that a year or two back, when Heathrow had a ‘record’ maximum (that coincided with three heavies landing in quick succession) it was only for five minutes, and quickly dropped back by about a degree. I suspect the higher temperature was set sometime between 3pm and 4pm, as presumably there are readings every minute or 5 mins. So is there any reason why Heathrow has become the hottest place in the UK? I just can’t think why, meteorologicaly speaking, Heathrow should be the warmest spot. It’s a real mystery, but obviously Climate Change is affecting Heathrow more than any other spot. In the center of the Arctic will be a deep low, which ensures a low temperature over the North Pole. The geomagnetic field deflects incoming cosmic ray particles depending on their magnetic rigidity and angle of incidence. The rigidity of a particle is defined as the momentum per unit charge R = pc/Ze, where p is the momentum, Ze is the charge of the particle, and c is the velocity of light. America should be prepared to increase precipitation. 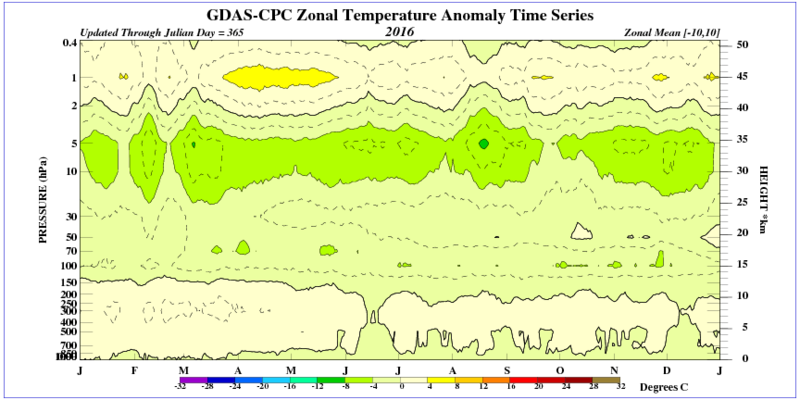 Stratospheric ozone is one of the most delicate aspects of habitability on the planet. Removal of stratospheric ozone over the polar regions in winter/spring has established the vulnerability of ozone to halogen catalytic cycles. Elevated ClO concentrations engendered, in part, by heterogeneous catalytic conversion of inorganic chlorine to free radical form on ubiquitous sulfate−water aerosols, govern the rate of ozone removal. We report here observations of the frequency and depth of penetration of convectively injected water vapor into the stratosphere, triggered by severe storms that are specific to the central United States in summer, and model their effect on lower stratospheric ozone. This effect implies, with observed temperatures, increased risk of ozone loss over the Great Plains in summer. 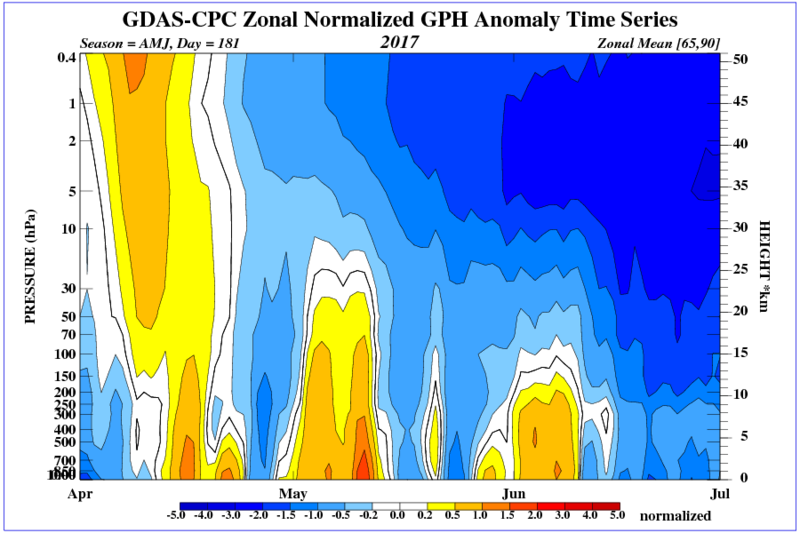 We present observations defining (i) the frequency and depth of convective penetration of water into the stratosphere over the United States in summer using the Next-Generation Radar system; (ii) the altitude-dependent distribution of inorganic chlorine established in the same coordinate system as the radar observations; (iii) the high resolution temperature structure in the stratosphere over the United States in summer that resolves spatial and structural variability, including the impact of gravity waves; and (iv) the resulting amplification in the catalytic loss rates of ozone for the dominant halogen, hydrogen, and nitrogen catalytic cycles. The weather radar observations of ∼2,000 storms, on average, each summer that reach the altitude of rapidly increasing available inorganic chlorine, coupled with observed temperatures, portend a risk of initiating rapid heterogeneous catalytic conversion of inorganic chlorine to free radical form on ubiquitous sulfate−water aerosols; this, in turn, engages the element of risk associated with ozone loss in the stratosphere over the central United States in summer based upon the same reaction network that reduces stratospheric ozone over the Arctic. The summertime development of the upper-level anticyclonic flow over the United States, driven by the North American Monsoon, provides a means of retaining convectively injected water, thereby extending the time for catalytic ozone loss over the Great Plains. Trusted decadal forecasts of UV dosage over the United States in summer require understanding the response of this dynamical and photochemical system to increased forcing of the climate by increasing levels of CO2 and CH4. What have ‘increasing levels’ of these trace gases (trace = very small percentage relative to the whole atmosphere) done in the last 20 years? Nothing much of any note. Getting that 70’s vibe too, what comes after all the warming hype of summertime 2017 will be some brutal winters and an Ice age a cometh… Note to Leif, watch and learn dude. Here is a link to the paper. 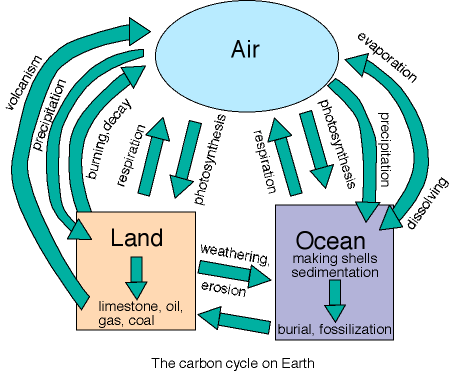 This false hypothesis is the basis of all the IPCC climate models (e.g. CMIP) that can’t even predict the past. Thanks to Ned Nikolov, Karl Zeller, Scott Denning, Tyler Robinson, David Catling and others we now know that the GHE is much larger than the 33 K claimed by consensus “Scientists”. Since 1976…about the last time there were hot summers in England and California. Not that any RECORDS were actually broken. The modern superstition is that any time it is uncomfortable, it’s our fault. The Maunder Minimum (A.D. 1645–1715) is a useful period to investigate possible sun–climate linkages as sunspots became exceedingly rare and the characteristics of solar cycles were different from those of today. Here, we report annual variations in the oxygen isotopic composition (δ18O) of tree-ring cellulose in central Japan during the Maunder Minimum. We were able to explore possible sun–climate connections through high-temporal resolution solar activity (radiocarbon contents; Δ14C) and climate (δ18O) isotope records derived from annual tree rings. The tree-ring δ18O record in Japan shows distinct negative δ18O spikes (wetter rainy seasons) coinciding with rapid cooling in Greenland and with decreases in Northern Hemisphere mean temperature at around minima of decadal solar cycles. We have determined that the climate signals in all three records strongly correlate with changes in the polarity of solar dipole magnetic field, suggesting a causal link to galactic cosmic rays (GCRs). These findings are further supported by a comparison between the interannual patterns of tree-ring δ18O record and the GCR flux reconstructed by an ice-core 10Be record. Therefore, the variation of GCR flux associated with the multidecadal cycles of solar magnetic field seem to be causally related to the significant and widespread climate changes at least during the Maunder Minimum. ren – GCRs are a proxy for solar wind strength. In the historical record of solar activity the period from 1645 to 1715 is a singular epoch during which the number of sunspots decreased markedly for a generation. Known as the Maunder Minimum, this solar epoch coincided with the coldest part of the Little Ice Age (circa 1450 to 1850). We estimate the change at this time in the output of solar ultraviolet (UV) radiation at wavelengths from 120 to 300 nm, relative to contemporary observations. Since this portion of the solar UV spectrum determines ozone composition in the stratosphere, our results bear on the historical variability of ozone and its potential climatic effects. Between the Maunder Minimum and 1986 (the present day solar activity minimum between cycles 21 and 22) we estimate reductions of 64% in the irradiance of the Lyman α line of neutral hydrogen (at 121.6 nm), 8% at 200 nm, and 3.5% in the wavelength range from 210 to 250 nm. The reduction in the solar output from the entire spectral band between 120 and 300 nm is estimated to be 0.17 W/m2, which is approximately 6% of the change in the total solar irradiance of 2.7 W/m2 previously estimated by us (Lean et al., 1992a) over the same time span. Because of this diminished UV output due to very low solar activity the Maunder Minimum total ozone concentration may have been 4% below its 1980 level. While the climatic consequences of such a change have yet to be determined, recent work by Haigh (1994) on modulation of radiative climate forcing by stratospheric ozone emphasizes the need to understand the role of UV irradiance variability as one forcing mechanism. 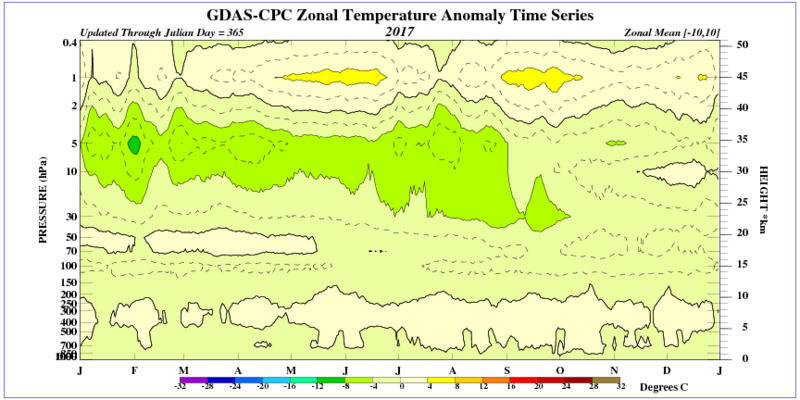 The temperature in the stratosphere above the equator shows a clear fall in ozone. It is difficult to predict what the consequences will be, but it will definitely change the circulation in the stratosphere. Significant man-made warming due to CO2 was, is, and always will be a crock. Comment: the general idea of course is that cooling oceans absorb CO2 while warming oceans expel it, as the oceanic part of the carbon cycle. So less outgassing suggests, or indicates, cooler waters. Some “carbon” magic happened. obviously there is no such thing as magic.